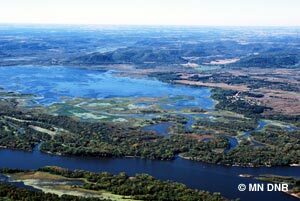 monitoring (started in 1993) of aquatic habitat and fish populations in Navigation Pools 3, 5, 5a, 6, 7 and the MN portion of Pool 9 of the Mississippi River and also on the Lower Vermillion River (predominately backwaters). This free map book is also available at the Lake City DNR office. Sturgeon are pre-historic fish that have evolved in large river systems throughout the world. Populations have been threatened due to overfishing of the species for caviar production and secondarily by habitat reduction and pollution. 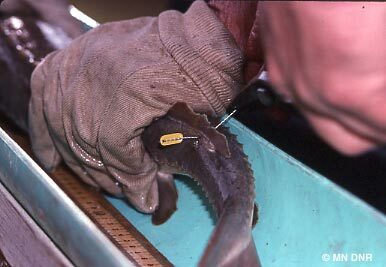 The Lake City fisheries crew began tagging lake sturgeon in the Mississippi River in the spring of 2007 to determine population abundance, size structure, and movement. Currently, 149 fish (between 13-63.5") have been tagged. Most were captured and tagged below Lock and Dam 3 (Red Wing). A similar tagging study is being conducted in Lake St. Croix. These "St. Croix" fish have been documented as far down as lower Lake Pepin. So You Found a Tagged Fish?